As we move into the final 48 hours of the Shelter in Place Kickstarter, I’d like to share what I’ve been working on with my cohorts as a gift to everyone who contributed and pushed us over our first and second goal. 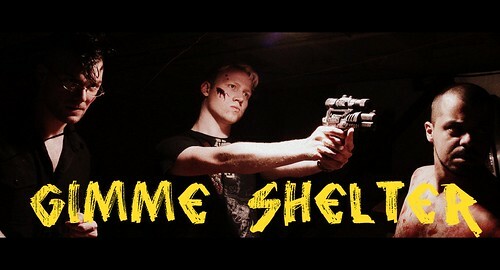 It’s called Gimme Shelter and it’s an anthology of fiction from the zombie Apocalypse. I’ve been reading the stories as they come in, and they are exciting, funny, and extraordinarily moving. Putting together this anthology, I expected to have humor and horror and adventure, but I’m not sure that I expected heart-wrenching – although with writers like these, I should have known better. Below are excerpts from some of the stories that will be in the anthology. The strike against the door was hard enough to make the wood splinter. It was also hard enough to make the shotgun in Reggie’s hand jump. He splayed his fingers on the fore-end, and that was when he noticed how sweaty his hands had become. With one shell at the ready, another already in the chamber, it was time to implement Plan B. Nobody replied. The entire gas station was silent, except for the muffled moans coming from the ice-cream freezer. Fred sat on what was left of his recliner watching Lilly eat the collie. “Poor old girl.” Lilly didn’t answer, didn’t even grunt as she chewed through their dog. Right after they’d gotten married, Fred and Lilly had agreed on dogs, not kids. Dogs you could give to a shelter if it turned out you weren’t a very good parent. He’d never been more glad about that decision than right now. I was supposed to get laid tonight. Instead, I’m sitting at a table in a very hip restaurant – La Merde – alone. And the likely very-large bill is coming my way. Pistols were built for short range combat. It was a good weapon for anywhere indoors. It was given to the brave fools sent into buildings looking for supplies. The walkers were still on the street outside, but their aimless milling about had stopped, and they were all peering in more or less the same direction, down the street where it intersected with Oak Avenue. They’d started keening, but they hadn’t moved yet, which meant they were alert, but still searching. Their vision wasn’t good at night; when the sun went down, they mostly hunted by noise. Then he caught what had set them off and swore. Do you feel enticed? Tempted? SEDUCED?